You've worked hard, saved the money, and burned through all the energy you have. Now, it's time for a vacation, and you've picked the perfect place. Your work life can handle itself for a few days. You're going to Costa del Sol, and you're excited to dive into the architecture. Luckily for you, there's plenty of wonderful sites to see. 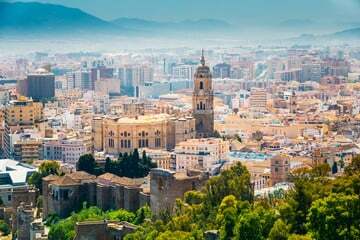 Below are 6 spots you must visit to experience Costa del Sol architecture fully. Make sure you keep reading so you don't miss any spots. Even if you're just going for a festival in Spain, don't miss out on taking some time to go see this marina. Not only is the architecture incredible, but the Benalmadena Marina also offers plenty of leisure activities such as fishing and shopping. You can easily make a whole afternoon walking around and shopping while staring out at the islands of homes on the water. It's a grand sight to see. If you're a lover of Baroque painters, you'll love this Baroque-style cathedral. It'll take your breath away with it’s enormous floor-plan and paintings by Diego de Vergara. When you visit, make sure you check out the choir area and make reservations to explore the rooftops. You won’t want to miss either sight. This Costa Del Sol architecture will amaze any visitor with its traditional touches and modern market. It brings in hundreds of people searching for fresh produce, being the perfect place to pick up ingredients for a Spanish dish. In the past, it's served as a shipyard, military hospital, and a warehouse. Not only does it have fresh vegetables, but it also has a history. Completely worth the visit and slight entrance fee, these baths bring you back to the 13th and 14th centuries. They are located within the Arab section of the city, bringing you face-to-face with history you may not be familiar with. You'll quickly fall in love with the enormous ceilings and intricate details. This site will blow you away. Between a water mine, a house, and gardens, no picture will do it justice. Upon visit, you’ll immediately notice the all-around stillness of the environment. You’ll never want to leave as you venture across the grounds. Combining religion and Costa Del Sol architecture, don't forget to add this mosque to your list. No matter what background or religion you come from, you'll be impressed. This mosque was only built a few decades ago, being one of the first modern mosques in the area. It can hold over 800 people and showcases vibrant gardens. During your trip to Spain, make sure to check out the wonders of Costa del Sol architecture. You'll be in awe of the overwhelming history and art of each location above. Make sure you add these locations to your list now. Between gardens, mosques, and markets, you'll never get grow bored of the mixture of historical and modern sights. It’ll be difficult to go back to reality. If you are looking to buy, rent, or sell in Spanish real estate, make sure to contact us.